A Portable Infrared Sanua for every need and budget. Portable Far Infrared Saunas which are also known simply as a Portable Infrared Sauna will heat only 20 percent of the air, leaving over 80 percent of the Portable Saunas energy available to directly heat the body. Thus, a portable infrared sauna can warm a user faster and more efficiently than conventional portable saunas, while enabling them to breathe easily. You can lose weight and detoxify your body in just 15 to 30 minutes a day. Our portable saunas provide all the healthy benefits of natural sunlight without any of the dangerous effects of solar radiation. The invisible and very safe far infrared heat produced by our portable saunas can penetrate 1.5 inches - 3.inches into the skin, which enables the body to sweat at temperatures of 110 - 140 F (Compared to the temperatures of 180 - 240 F found in conventional steam saunas). Please scroll down the page for additional information. The human body recieives and responds to the heat produced by a portable Infrared Sauna on a cellular level which naturally increases the bodys circulation and blood flow. 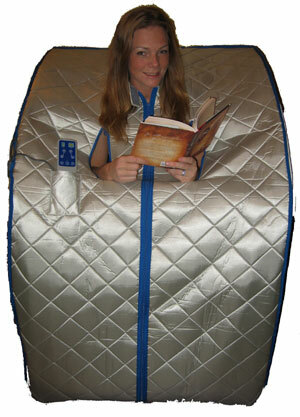 Portable Saunas are excellent for burning calories, controlling weight, and removing cellulite. Weight loss occurs because body fat becomes water soluble at 100 degrees fahrenheit and the body can sweat out fats, toxins, and heavy metal that it otherwise can't dispose of. Most clients who have attempted weight loss by diets without success, will be pleased with the results achieved by combining healthy eating habits with the regular use of a quality portable infrared sauna. A Portable Infrared Sauna can be very valuable for those who don't exercise and for those who can't exercise, yet need an effective weight control and fitness maintenance program that provides the benefits of regular exercise. What About Toxin Removal? The process of perspiration is nature's way of detoxifying your body of waste materials that are accumulated in your daily life. The Infraspa Turbo models of far infrared saunas that we offer provide the extra heat and ion therapy to help the body prespire and detox s in an exaggerated but healthful way - The InfraSpa turbo line of Portable Saunas will stimulate this natural process at comfortable, low temperatures. High quality Far Infrared Saunas to meet every need and budget.